I am from Lithuania. We have a flat tax rate. And believe me my country is a fastest growing in EU last 20 years (you can google “Baltic Tiger”). Some stupid social democrats in my country (all of them were communist party members when Lithuanian was occupied by USSR) are promoting progressive taxation….Since in USSR the progressive taxation was in place for a century (it was a complete confiscation of everything you had more than certain amount) – I have spent all my life in poverty. I support views expressed here, I literally feel in on “my body”. The problem as always is that no matter how much government takes in taxes it will always spend more. This has been so since at least Biblical times when kings spent the treasuries dry on war, lavish living, massive building projects for their glory, or a combination of these and other things. Lower taxes will help but ONLY if coupled by strict spending controls, especially with social spending. Reblogged this on Peekow's Blog. “So why did Wolfers and Thoma create a straw man in an attempt to discredit the Laffer Curve? Let me leave aside the proposition that Republican politicians bear any responsibility for what Wolfers and Thoma have to say—an implication equally invidious to those politicians and those economists. I probably need to get out more. Who are these Republican politicians who make silly claims that “all tax cuts pay for themselves”? There are lots of hits on that quotation in Google, but they all seem to be talking about what other unnamed people wrongly believe. Speaking of creating straw men. Seems to me the purpose of an economic system and tax policy etc. should not be to maximize the revenues to government but to maximize the standard of living for the citizens. The point of maximum revenue to government is not the point of maximum standard of living. If you take the tax revenue curve and divide the revenue received by the tax rate you will have a size of the economy curve. This curve is highest at the lowest tax rate and when the tax rate is 100% there is no economy to be taxed, everyone will be in the barter economy, working off the books at a very low standard of living. The shape of the size of the economy curve is a good proxy for the standard of living curve and is also a good proxy for the number of jobs in the economy. A high standard of living and lots of jobs at low tax rates and no jobs and a low standard of living at high tax rates. And if you consider the number of jobs in the economy vs the size of the work force, where there are more jobs available than workers, pay is high. Where tax rates are high, jobs are few and pay is low. High tax rates cause income inequality. How? When there are more jobs than workers to fill the jobs, employers must bid up wages to the point where the wages approach the total value of added production of the worker. So the worker gets close to full value for his labor. In the case of more workers than jobs available as in high tax rate environments, the employer does not need to pay anything close to the value of the labor. This means the employers profit per employee is low under low tax rates and high under high tax rates. Under high tax rates the employer makes a lot of profit per employee and pays a lot in taxes, under low tax rates the employer makes less per employee and pays less in taxes. The net to the employer may be about the same. But the employee is definitely better off under low tax rates. Neill, what you, and everyone else, forgets when you quote Iron Maggie is that socialism may not be the ultimate goal of some of these people. I’ve come to the conclusion is that it’s just an excuse to grab power. Socialist countries never had particularily good economies but they had damned effective dictatorships. Mark, your example perfectly illustrates the complete failure and total disaster of a Socialist/Leftist Govt. Your Govt has made you LESS PRODUCTIVE on purpose. That is a tyrannical out of control Govt that has over reached by a very large Factor. Iron Maggie: The trouble with socialism is that eventually you run out of other people’s money. You may want to make yourself a diagram that emphasizes the fact that the government’s revenue-maximizing “point” varies with the period considered. If the gov’t wants to steal everything now and ignore tomorrow, the time frame is 0 and the revenue is 100% (more than that if they sell off all assets too). If the gov’t wants to maximize revenue over an election cycle, it’s around 70% of its subjects’ income. To maximize revenue forever, pick the growth-maximizing point where all gov’t functions add to the economy more than they take in taxes. I think that’s roughly 15% – lower in poor and higher in rich countries – and will also depend on how well the institutional arrangements prevent it from growing ever larger, more powerful and more sclerotic. As someone who is flirting in that area, I’m determined to not make more than £100,000 taxable income. 60% is excessive. 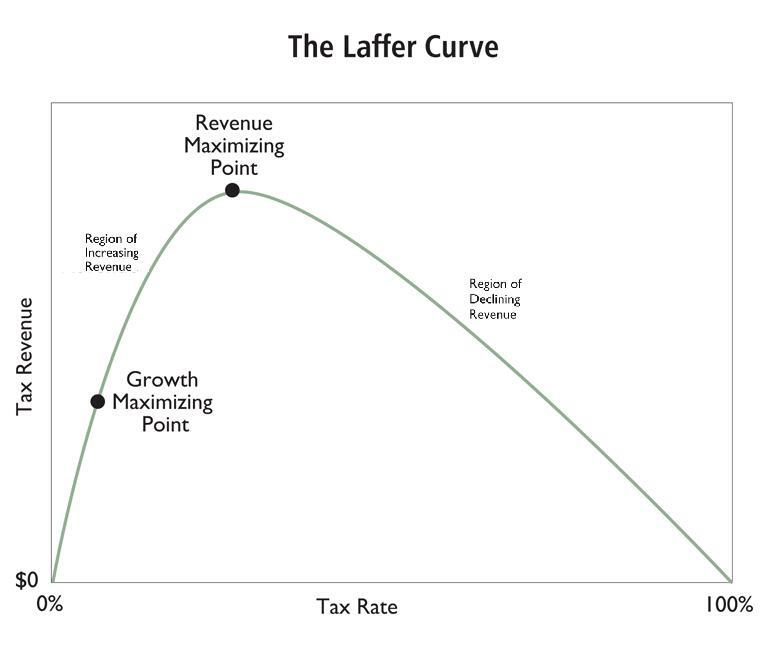 The Laffer curve isn’t something the Leftists can wrap their head around, so it doesn’t exist. Simple as that. Err, wouldn’t the growth-maximizing rate be zero? I’m not saying that’s practical, since we need a certain amount of government that must be paid for. But I can’t see a 25 percent rate causing more rapid growth than 0 percent. I saw a study of taxation and growth around the world that placed the Growth Maximizing Point at 25% and the Revenue Maximizing Point at 45%. Naturally, the “developed” countries cluster around the 45% mark. It cannot be otherwise in a democracy. If elected leaders sacrificed present spending for future growth, they would be voted out of office, and the benefits of their thrift would accrue to their political enemies. A professional economist that is consistently wrong as Krugman would not long be employed as an economist. Since Krugman is clearly prospering, it makes sense to conclude that he is primarily not an economist. His function, for which he is handsomely compensated, is to provide an economist-esque patina to what is, at the core, a political agenda. There will always be those in power, as Zorba alludes to, that will pay for this service, knowing it to be false, but useful. If I had one wish about talks about economics it would be this,that the name Paul Krugman NEVER be mentioned.It just demeans the entire philosophy. on July 2, 2012 at 1:55 pm Instapundit » Blog Archive » DAN MITCHELL: The Laffer Curve Wreaks Havoc In The United Kingdom…. There is little demand for non-interventionist economists. People like to at least hope that sooner or later a perpetual motion machine of prosperity will be found, or krugmanesque stimuli which after the initial push yield long term prosperity with less effort. People’s desire for redistribution is irresistible. That is the wellsprings of big government. Most people understand the other detrimental effects of big government. But redistribution is too irresistible to pass on and that enables all the other pernicious actions of big government. Those electorates that refrain from redistribution will be the successfull ones in this early 21st century. With America down the race is on.